Marinade meat for 2 or 3 hours in the refrigerator, turning every 1/2 hour. 1 hour before cooking remove from the refrigerator. Get the grill hot and cook to desired doneness. Let rest for 10 to 15 minutes. While the meat is resting heat up your tortillas. Dice into cubes, for the final cut cut across the grain. Load up your tacos the way that you like them. Thank you, James. Will be making these. Mmmmm. Missing Mexico, this might help a bit. I am sure it will help a little. Wow, that sounds delicious! I haven't made my own Carne Asada since leaving San Diego for Dallas/Fort Worth back in 1999. You've made me want to make those for when my brother visits in a couple weeks. PPT, you speak my language. 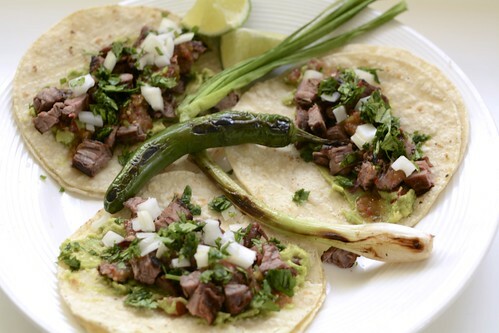 Carne Asada is my favorite taco/burrito filling, though I was introduced to it differently. I fell in love at first bite. Yours looks so good. If you want another variation, let me know and I'll post it here. I've never had a carne asada recipe I didn't like. Why not do a test run before he arrives, then you have 2 reasons for making tacos. Please post your version. Having more than one way to cook them is always good. Excellent point! Perfect food to eat while watching a baseball game on TV. I know what I'll be making soon. Grill the steak over direct fire until medium rare. Sprinkle with salt as it cooks. Remove from the heat and let cool enough to handle. Dice the meat so as to fit in a taco. Heat a tbs. of cooking oil in a heavy pan. Add everything but the meat. Stir-fry until the veggies have just a little crunch left. Add the meat and heat. Squeese fresh lime juice over everything. Serve with guacamole as taco, or burrito filling. The smokey flavor of the grilled beef goes oh so well with the other flavors. Enjjoy. Are you sure that wasn't La Casita off of Bradley and 67 in El Cajon? We used to live right down the street (literally walking distance) from there before moving to Texas. Best Carne Asada in the world - especially the Ensalada La Casita with Carne Asada. I can remember how delish that was.